The Thermoworks Thermopop thermometer is a more than functional thermometer designed for the minimalist shopper. 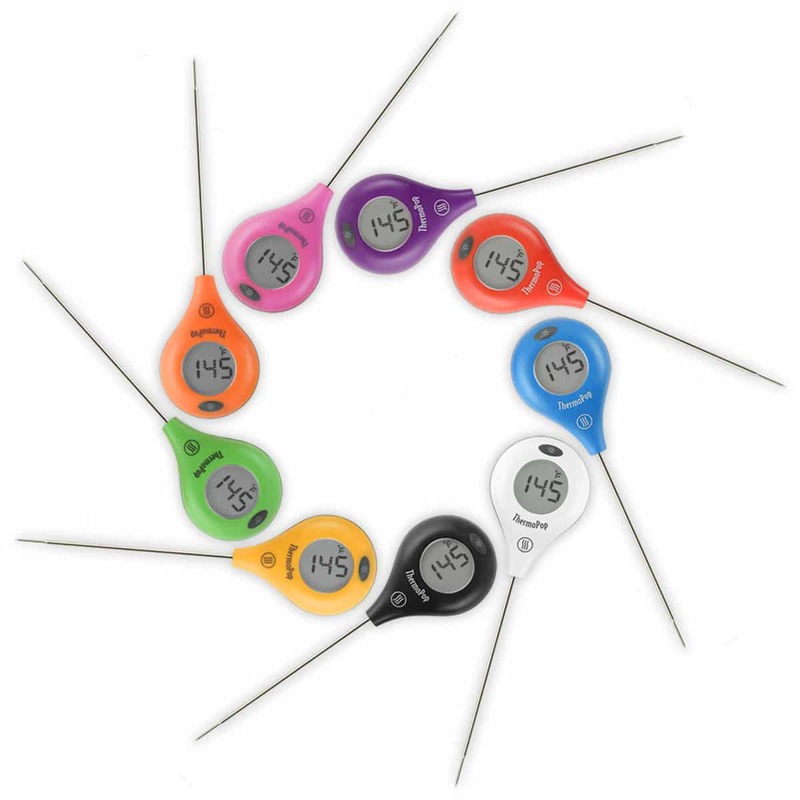 The small, accurate thermometer comes in nine colors and offers some of the fastest temperature readings around. Thermoworks offers this as a cheaper option to their high-end thermometers bringing many of their award winning features at a fraction of the cost. With the design team at Thermoworks, you can be confident that it is a well-built utensil. Whether you are a baker, griller, or an at home cook, the Thermopop is a great base thermometer, and worth checking out. ThermoWorks Often Has Deals Going On For Their Products. Thermoworks always builds quality products, and the Thermoworks Thermopop thermometer is not an exception to this. The Thermopop is a low price option of their high-end thermometers. Anyone who is looking for a simplistic, easy-to-use instant-read thermometer, the colorfully fun ThermoWorks ThermoPop Thermometer is an excellent choice. It gives the same accuracy and quick reading as their other thermometers, but at a noticeably lower price. Whether you are a new or experienced cook, having an accurate thermometer is always a great asset. Baking bread, barbecuing meat, oven roasting, or simmering food can all be improved with better temperature accuracy. The Thermopop comes within 2°F of the exact temperature of your food. Waiting for a slow thermometer can be a pain as well. The time you are waiting for the thermometer to show you the actual temperature means keeping your hand over a hot heat source, risking burning. The Thermopop Thermoworks cooking thermometer saves your hand the pain by displaying the temperature in three or four seconds. It features large, easy to read digits, a rotating display so you can check readings from any angle, and a thin 4½-inch long tip. Plus, it has a display backlight so you can read it when you’re grilling outdoors in the evenings. The 5,000 hour battery life, along with the auto-off/sleep feature saves you the time and money of replacing batteries often, a big benefit when compared to some other instant read thermometers that die after a mere 2,000 hours. The Thermopop is simple to use and requires little to no setup. By simply inserting the battery and taking off the probe sleeve of the thermometer, you are ready to go. If you want, you can choose readings showing either Celsius or Fahrenheit. With the press of one button, you can turn the thermometer on and off. The display readings rotate at 90-degree intervals with a push of a second small button located on the back of the unit. You can activate the backlight on the display by pushing the button located on the top front of the ThermoPop. Beyond that just insert the probe into the center of your food. Make sure the probe is as close to center as possible to get the most accurate temperature reading of the food. Within three to four seconds, the Thermopop will display your temperature on its rotating screen. If you are between uses of the Thermopop, you can wipe the probe and set it to the side. Its auto-off feature will turn it off after ten minutes. Simply press the power button to turn it back on. The Thermoworks Thermopop thermometer is a small thermometer meant to blend functionality and style. The thermometer itself is less than five inches long with a probe length that is 4½ inches. The bulbous head comes in nine color options and makes for an easy grip. This is nice because you can choose the color that best matches your kitchen or utensil setup. The read speed of the Thermopop keeps you from burning your hand or having to wait long for the temperature to display. Responding in less than three to four seconds, the Thermopop is a quick reading thermometer, to say the least. The auto-off feature is another cool feature of the Thermoworks Thermopop thermometer. After ten minutes of inactivity, the Thermopop turns itself off. It is simple to power back on, making this feature a great way to save battery life. No worries if you forget to power off the thermometer when you’re done using it and you won’t drain the battery when using it multiple times in one cooking session. The physical design of the Thermopop makes it easy to use for both left and right handed people. The display features a rotating screen, which is an awesome addition to the Thermopop. When you tilt the thermometer, the display can rotate as well. It will show in four different directions, changing by 90° angles, including upside down. No more bending your head in awkward directions trying to read the display, the thermometer does that for you. The Thermopop’s accuracy isn’t the best in the business, but it certainly gets the job done. Coming within 2°F of the exact temperature, the Thermopop gives you a great idea of how hot your food is. The industry standard for high end thermometers is closer to 1°F of perfectly accurate, which is one of the Thermopop’s only downfalls. This level of accuracy should still be sufficient for most outdoor cooks and chefs, and the tradeoff of speed should help cover it. The entire thermometer is rated IP66 splash resistant. This makes it completely impenetrable to dust and will withstand “high-pressure water jets from any direction” according to the manufacturer. With a whopping 5,000 hour in use battery life, there is one less thing to worry about. Compare this with most thermometers in this price range or better and you can appreciate what Thermoworks has done. And changing the battery on such a small device is a breeze when stacked up to similar products. You just pop the back off with a regular sized flat head screwdriver and insert the new battery, twist the cover back on, and you are all set. Like all of Thermoworks products, the ThermoPop has a huge temperature reading range of -58 to 572 degrees Fahrenheit. That is a lot of Pop (pun intended) for such a little thermometer. 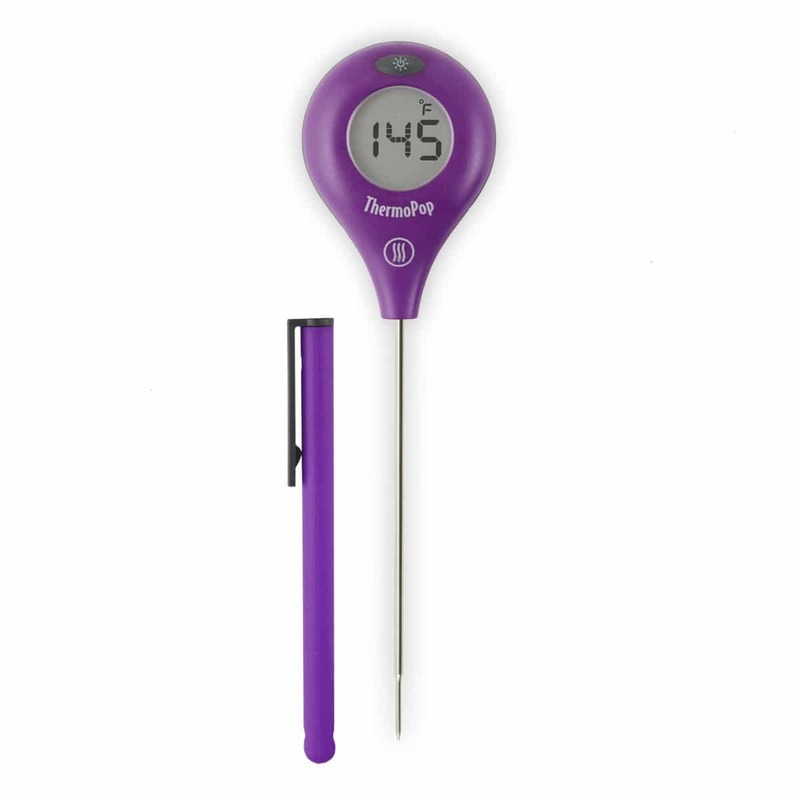 Thermoworks always offers a wide assortment of colors, which is a great way to personalize your thermometer. This makes sure you get the exact color to match your cooking equipment or style preference. Who Is The Thermoworks Thermopop Thermometer For? The Thermoworks Thermopop instant read thermometer is a great, inexpensive, rapid read digital thermometer offering high end performance for cooking usage. If you are a new or experienced griller, the Thermopop is worth taking a long look at. Anyone who is new to grilling needs an instant read thermometer. It helps make sure you get that perfect cook every time you grill. The rapid reading time and accuracy makes the Thermopop top of the line in instant read thermometers. If you are a more experienced chef, the Thermopop is possibly even more worth your time. It allows you to take that extra step in accuracy, and convenience. If you have used an older instant read thermometer (not to mention an analog thermometer) you understand the issues that make the Thermopop such a well designed thermometer. If you are used to the performance of the original Thermapen, the most obvious thing you lose is a little speed and accuracy. Reads that used to take two to three seconds now take up to four. You also lose over a degree in precision and accuracy. Not a huge deal but a slightly noticeable difference if you are used to the Thermapen. For all but the most seasoned chefs, this should not make much of a difference on the final outcome. Moreover, if you are a cook that enjoys being mobile while grilling your food, an instant-read thermometer might not be what you’re looking for. A wireless remote thermometer might be more up your alley. This is especially true if you smoke food often, or slow grill your food at specific temperatures. Another excellent option and my runner up for the best inexpensive instant read thermometer is the Original Lavatools Javelin. A great meat thermometer, but just not as cool as the Thermopen Thermopop. The only real let down for the Thermopop to me is its temperature accuracy. Thermoworks usually has some of the most accurate thermometers available. The Thermopop doesn’t offer this, unfortunately. A few other small nitpicks for me are because of the straight style design, you can’t fold or move the probe to different angles helping to keep your fingers farther away from the heat. The buttons require a little harder pressing as well. Sometimes I had to press them a couple of times to activate it. What the Thermopop lacks in accuracy though, it makes up for with convenience. The easy to use and simple design make it a great thermometer for camping, traveling, or even at home use. The small design makes it easy to pop it into your shirt pocket or apron, keeping it out of the way. The color options give it a fun look, whatever you are looking for. It is easy to spot in a crowded drawer because of the bright colors as well. The quick temperature reading is also a great benefit. No need to wait for an analog thermometer when you can get the temperature read in less than four seconds with the Thermopop. The Thermopop comes in at around $29. A relatively low price, especially when compared to similar or other Thermoworks products. The price for the accuracy is really what makes the Thermoworks Thermopop thermometer worth it though. Reading through the owner’s manual, the warranty isn’t explicitly stated and I could not find it on ThermoWorks site either. Thermoworks has an excellent reputation though and is known for standing proudly behind its products. The Thermopop is a great base, low cost thermometer. If you are looking for an instant read thermometer, I highly recommend checking it out. I will go so far as saying that it’s simply the best inexpensive thermometer in the market today. While it doesn’t have all of the bells and whistles of some of Thermoworks other products, it certainly has everything you need. If you need a thermometer to be quick and accurate than the Thermopop might just be what you’re looking for. Not to mention the look and design, as well as the cool extra features make the Thermopop a great buy. The nine color options give it some individuality, and the rotating display is a great extra feature. For all you outdoor warriors and home chefs out there who are not looking to shell out $99 for the Thermoworks MK4, this may be the ideal option you have been searching for. I hope this Thermoworks Thermopop thermometer review was helpful for you. As always, if you or someone you know is interested in grilling or food thermometers or you find this information useful, please consider sharing it with your grilling friends and on social media! If you would like to leave a comment or have a review of your own to share on Thermoworks Thermopop thermometer, please do so below. We always welcome your input. At The Grilling Life, I am committed to researching and writing thoughtful, informative and editorially independent reviews of the best products for your outdoor cooking needs. If you like what I do, you can support me through my chosen links, which earn me a commission. This allows me to continue sharing with you my love for all things barbecue. Your support is truly appreciated. ThermoWorks BlueDOT™ Bluetooth Alarm Thermometer Review And Rating – Another Win For ThermoWorks?